He had quite liked the dwarfs. He often had no idea what they were talking about, but for a group of homicidal, class-obsessed small people, they were really rather good fun. Thriller writer Connolly (Every Dead Thing) turns from criminal fears to primal fears in this enchanting novel about a 12-year-old English boy, David, who is thrust into a realm where eternal stories and fairy tales assume an often gruesome reality. Books are the magic that speak to David, whose mother has died at the start of WWII after a long debilitating illness. His father remarries, and soon his stepmother is pregnant with yet another interloper who will threaten David's place in his father's life. When a portal to another world opens in time-honored fashion, David enters a land of beasts and monsters where he must undertake a quest if he is to earn his way back out. Connolly echoes many great fairy tales and legends (Little Red Riding Hood, Roland, Hansel and Gretel), but cleverly twists them to his own purposes. Despite horrific elements, this tale is never truly frightening, but is consistently entertaining as David learns lessons of bravery, loyalty and honor that all of us should learn. I loved this book. I loved it from the first line- "Once upon a time- for that is how all stories should begin- there was a boy who lost his mother." Wonderful. I had no trouble delving deeply into it from there, and this book is the one that REALLY made me feel like my reading habit is back. Granted, in my last entry I stated that I didn't think my reading habit would ever be back to full force the way it was last year- and that will probably hold true. But, reading is fun again, and there isn't any guilt involved, and I still love that exquisite feeling of finishing a book with a sigh of contentment and then going to my bookshelves to choose the next one to read- no matter how long that book might take to read. This book did not take long to read. It only took a few days. On all of those days, I started reading in the night, and then read way past my bedtime- which, by the way, is never a good idea when you are reading a book which centers around rather twisted fairy tales. This book is very much in the tradition of the "quest" fantasy novel- a boy enters a foreign realm and spends the vast majority of the book trying to get somewhere, to talk to someone, so that he can go home again. I love how some authors can vary that plot into something so enchanting. Like most kids, I grew up watching the Disney princess stories made into cartoons (I especially had an unhealthy obsession with Cinderella). Those were the fairy tales I knew. They are not the ones the Grimm brothers wrote, and when you think about them, truly... they're pretty bland. Connolly makes them much more interesting- Rumpelstilskin is a major force in the novel, Snow White is an obese and vulgar girl forced on the seven dwarfs who attempted to kill her, Little Red Riding Hood was a strange girl who *really* liked wolves, and Goldilocks eventually got her just desserts. I always thought Goldilocks was a brat, myself, so I'm quite happy with Connolly's take on that story. But the central figure is David, a lonely 12-year-old boy looking for his dead mother and creating a ruckus in the other world while doing so. And when you get down to it, the story is more a coming-of-age tale than fantasy quest. David gets over himself, manages to defeat a few terrifying demons, and then returns home safe and sound and changed. If you enjoy fantasy, then I strongly recommend this story. If you like fairy tales, I'd strongly recommend this book. 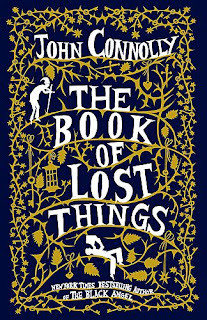 If you like young adult books that crossover very neatly to the adult genre- then I would strongly recommend this book. Stories were different, though: they came alive in the telling. Without a human voice to read them aloud, or a pair of wide eyes following them by flashlight beneath a blanket, they had no real existence in our world. They were like seeds in teh beak of a bird, waiting to fall to earth, or the notes of a song laid out on a sheet, yearning for an instrument to bring their music into being. They lay dormant, hoping for the chance to emerge. Once someone started to read them, they could begin to change. They could take root in the imagination, and transform the reader. Stories wanted to be read, David's mother would whisper. They needed it. It was the reason they forced themselves from their world into ours. They wanted us to give them life.